British governments are not moral beacons when dealing with refugee crises. The current (2015) British government’s toxic position on Syria closely resembles the Jewish refugee crisis of 1933-9. Nazi efforts to make Germany ‘Jew free’ accelerated throughout those years. Despite the government knowing that refugee numbers were growing and the crisis was worsening, charities were left to cope as best they could. German Jews were asset stripped prior to emigration making them incredibly vulnerable to the accusation that they would be a burden on the receiving state. The British government steadfastly procrastinated on the refugee issue, mendaciously responding to the clamour for help. The Balfour Declaration (1917) acknowledged Zionist aspirations for a ‘Homeland’ in Palestine, which Britain did not control. British Jewish leaders extracted commitments, which had unimaginable unintended consequences. Between 1933 and 1939 European Jews fled in their tens of thousands with many travelling to Palestine. The Nuremberg Laws (1935) were the principal catalyst for German Jewish immigration into Palestine with 61,000 arriving that year*. Tensions increased between the Arab population, who were largely peasant, and sophisticated Europeans, because of both religious and economic differences. Rioting, amounting to a virtual civil war, engulfed Palestine. The British had to take a political decision as to who they would support. They chose the Arabs. Throughout 1938 Palestine became increasingly tense. The Arab-Jewish conflict was ‘policed’ by the British, who believed the situation was untenable. The British Foreign Office was quite clear that Jewish immigration into Palestine should cease, to ease communal tensions. This was at precisely the time when pressure for an international solution to the German Jewish crisis was coming to a head. The British delegation to the Evian Conference (1938) came declaring that further Jewish migration to Palestine was ‘off the table’. A British response to Jewish migration could therefore only be in the British Empire, or Britain itself. In a ‘satirical’ reply in a debate about refugees, Neville Chamberlain said that the British Empire was entirely unsuitable for European refugees**. His Majesty’s Government consider that there is no territory in the Colonial Empire where suitable land is available for the immediate settlement of refugees in large numbers, although in certain territories small-scale settlement might be practicable. By ‘small numbers’ he meant 200 refugees in Kenya, provided they were properly trained in agriculture. This was the week after Kristallnacht*** had been massively reported on by the British media. The Times (11th Nov 1938) said “No foreign propagandist bent upon blackening Germany before the world could outdo the tale of burnings and beatings, of blackguardly assaults on defenseless and innocent people, which disgraced that country yesterday.” The British government was unmoved. British policy hardened in May 1939 when all Jewish immigration into Palestine was halted for six months. Britain’s moral obligations amounted to shifty and evasive actions. Commissions were sent to British Guinea to confirm that that huge, empty colony could take a few thousand refugees. Western Australia**** could take a million refugees but the British government steadfastly refused. Britain itself took 10,000 unaccompanied children (Kindertransport). This was a drop in the ocean. British anti-semitism informed a great deal of the British government’s pre-war response to the Jewish refugee crisis in an insidious way. British governments routinely fail the litmus test of moral courage in times of event-driven refugee crises. The Nazi era demonstrated this and the current Syrian crisis repeats those pusillanimous failings. ***A pogrom of mass destruction of property, many murders and 30,000 Jews incarcerated in concentration camps. ****Australia took huge numbers of subsidised British immigrants after the war. 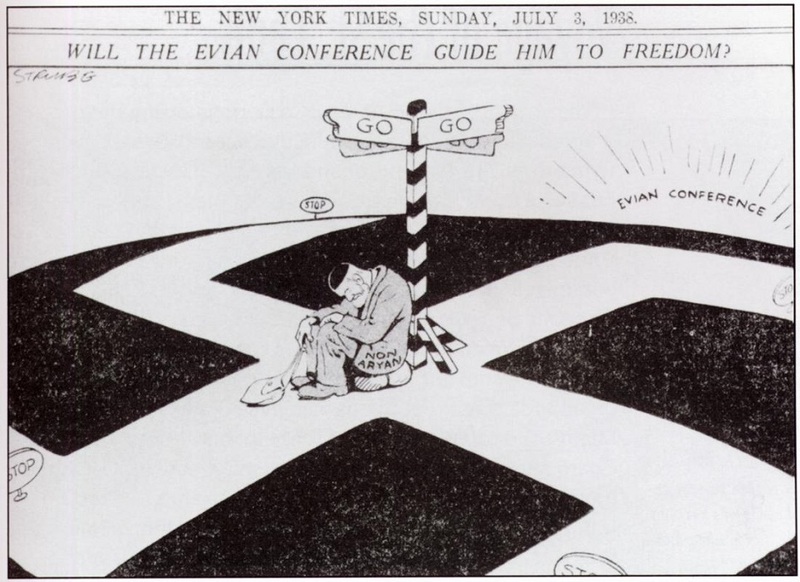 This entry was posted in Philosophy, Politics, Religion and tagged British Empire, Evian Conference, Jewish refugee crisis 1930s, Nazi repression, Neville Chamberlain. Bookmark the permalink.